The shelter said he was a Pit Bull mix, but weren't too sure on what he was mixed with. We have heard from many, that they believe he is mixed with Boxer. 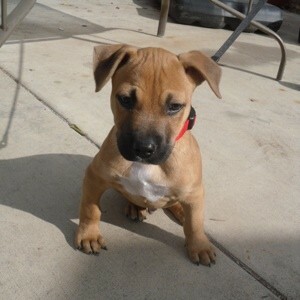 One of our dogs is a bigger version of your little one and we think he is pitbull/boxer. He is such a sweetheart. Whatever he is, he is cute as heck. Yep, it looks like a pit-bull/boxer to me.